My name is Rick and I’m making a career out of doing what I love to do. Bladesmithing and handmade goods. I quit my “normal” job at the age of 34 to become a full-time stay-at-home dad. When my kids became old enough for school, I looked forward to jumping back into the working world. Still, it was important to me to be available for my family when needed. Working from home was a logical solution. 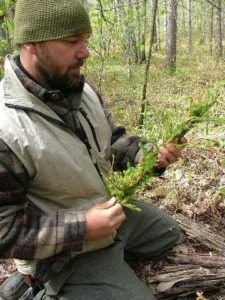 I always had a passion for the woods and studied with several wilderness skills instructors. Over the years, I had either made or modified my equipment to suit a variety of conditions and environments. Friends and colleagues showed a lot of interest in some of my creations and urged me to pursue a means to go public and possibly make a few bucks in the process. I enrolled in a self-employment workshop to learn the “not-so-fun” end of running a home business and began making leather products part-time. In 2007, I met ABS Master Smith, Wally Hayes, whose friendship and generous guidance proved to be invaluable to me. Wally’s help, coupled with 14+ years of experience in the tool, die and fabrication industry provided me with the skills necessary to bring my creations to life. As a result, Wildertools was born and was already taking its first steps into the world of custom made goods. There are few original ideas out there. I draw inspiration from the tried and true designs that many have used before me. I see what works and attempt to break it down to the raw essentials. While my artistic pieces allow me the joy of expressing my creativity, my true passion lies in shaping and refining Bush Tools meant for hard use. 1. The quality or state of being practical. 1. Born again, regenerated, revived. The push these days is to make something new, something innovative something “never before seen”. That’s how you make a name for yourself, right? WRONG! Being creative will get you noticed but you gain trust, appreciation and respect from being honest, open and believable. That’s how I run my business and lead my life. I don’t go for hype, trend or flash, I do what works. From wilderness skills to raising kids, we put our knowledge and tools to the test, it either works or it doesn’t. There is a time and a place for experimenting and it’s not 2 days into the deep wilderness. This is one of my favorite sayings and gets me in trouble quite a bit. Okay, I don’t make EVERYTHING I take into the woods but I at least have a working knowledge of how it’s made. I tend to think long-term with regard to wilderness gear. That doesn’t always mean “maintenance free”. Wool, leather, carbon steel and natural materials require some care but that TLC allows you to become more aware of your tools and conscious of your actions. The high-speed pace of today’s adventurers leaves a lot of room for error. Know yourself, know your equipment, SLOW DOWN and enjoy the journey, don’t get hung up on the final destination, we all know how it’s going to end. Wally’s friendship and guidance have been invaluable to me. He introduced me to bladesmithing and opened me up to the industry. Without his knowledge and generosity, I would still be making knife-shaped-objects as a hobby. He single-handedly made it possible for me to do this for a living. An ABS Master Smith, Wally has inspired me to follow his lead. I currently hold the ABS ranking of Apprentice. Thank you my friend. Bow has been my wilderness skills mentor since 2006. I was just a wandering “bushbum” before I met him. Under his tutelage, the wilderness has new meaning to me. He showed me how to look for the answers that the bush has to offer and for that gift I will always be thankful. There are many folks who inspire me to be a better craftsman, among them are makers like Daniel Winkler, Kevin Cashen, Tim Lively, Tai Goo and John Cohea. When it comes to wilderness skills, I follow the adventures of people like Les Stroud, Cody Lundin, and Ray Mears. I’m especially grateful to have known the teachings and friendship of the late Ron Hood. Countless other individuals have made an impact and helped shape my life, too many to name. I appreciate you all.